Aboyne Golf Club is celebrating after one of its young players, 19-year-old Dominic Bradburn, put the club firmly on the national golfing map by winning the Titleist Footjoy Match-play championship in Portugal. 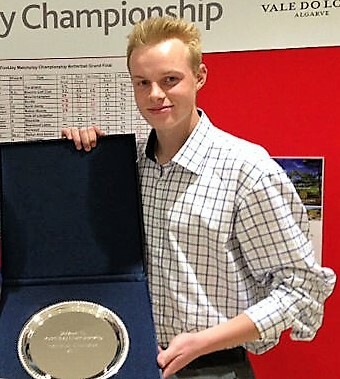 Dominic, who is in the second year at UHI Dornoch studying for a Golf Management degree, won three consecutive eliminating competitions across the North-east before securing his place on the Algarve this week by winning the Scottish regional qualifier at Irvine Golf Club. Played at the Vale do Lobo resort near Faro, Dominic competed in the four-round Stableford finals this week against the eight other regional low-handicap qualifiers. Dominic said: “It was the first time I have entered the competition and a real surprise and honour to qualify from Scotland and represent my club and country. To then go and win the final in Portugal against some very competent golfers was unbelievable. "The setting at Vale do Lobo was amazing and the courses were tough, requiring a lot of course management, particularly the third round which was played in atrocious rain and wind. “The tournament attracted over 1,000 entrants from across the UK. Dominic played extremely well over the four rounds at Vale do Lobo, scoring 31, 34, 32 and 34 for a total of 131 pts which earned him the title by seven points from his nearest rival.